This a just a quick post to let you know that our privacy policies at https://lopl.uk and http://lovelyplugly.etsy.com have changed. We use your data for fulfilling orders and customer service. Your data can be deleted by request. Your data is shared with the delivery companies that deliver your items, and Etsy or Shopify (depending on which shop you use). We may also need to provide data to comply with any legal obligations or court orders. CJ McAllister is our Privacy Compliance Officer, and any questions about your data can be sent to her through hello at lovelyplugly dot com. 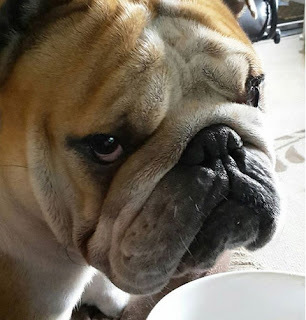 Sorry to bore you all, we've included a picture of our chief barketing officer, Sir Sidney Puddingbottom, in this post, who is wearing a look that says how most would feel when someone reads out loud several privacy policies when all they want is a bit of frothy coffee followed by a snooze.